* Some products were sent for review. Isn't it funny? When I was younger, I could give a crap less about skincare (like baking in the sun without sunscreen 😡- DO NOT RECOMMEND EVER!) and now that I'm turning thirty this year, I'm like, "GIMME ALL THE MOISTURE." But seriously. Taking care of my skin has become a high priority for me. 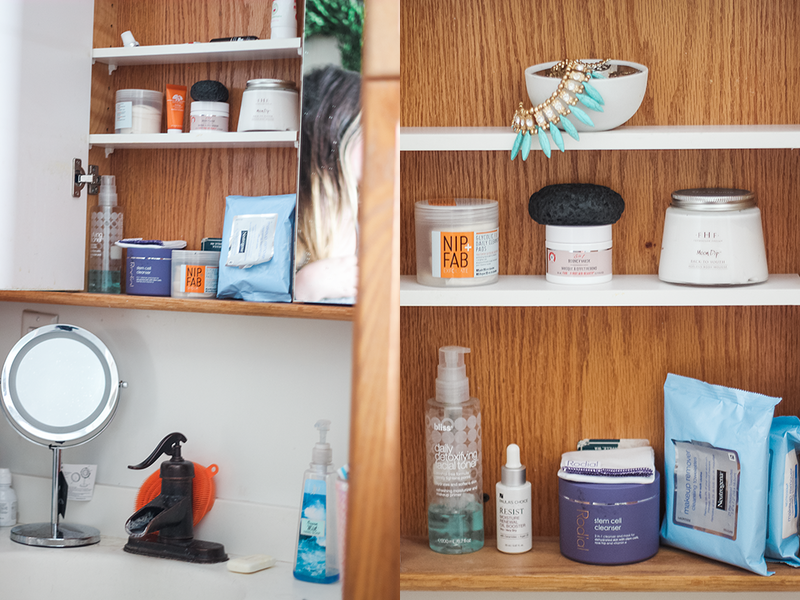 I'm so thankful that I have had skincare sent to me in the past but I know it can be confusing as a reader, wondering if I'm still even using those products. I know I wonder when I'm reading other blogger's post too. So I figured I'd compile my absolute faves; the ones that I've been using for awhile now and share them with you! Please note: My skin is normal with some dryness between the brows and around the nose. I wear contacts but do not have sensitive eyes. I have one facial piercing (a nose ring). I just like sharing those stats with you so if you have similar or different skin types, you can kind of gauge if you'd think the products would be right for you. Alrighty, guys? Are you ready? Let's do this! I figured I'd break everything down into what I do in the morning, before I apply makeup and then everything I do before bed. My routines don't use too many products and are pretty quick! Let's be real. Most days, I don't have a full face on. I really only put makeup on for blog posts and special occasions. Can you guess which time I put makeup on for most often? Yup. Blog posts. 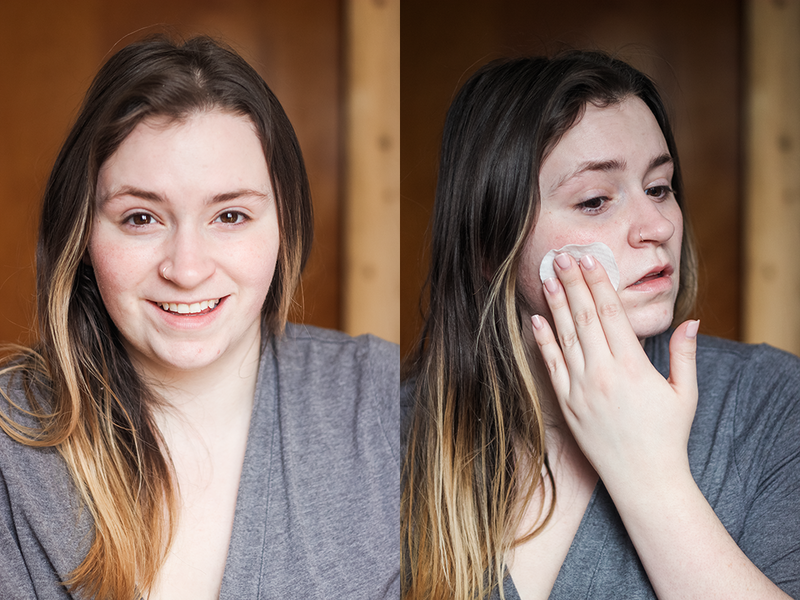 To prepare my skin for makeup, I like to start with a fresh, clean face. 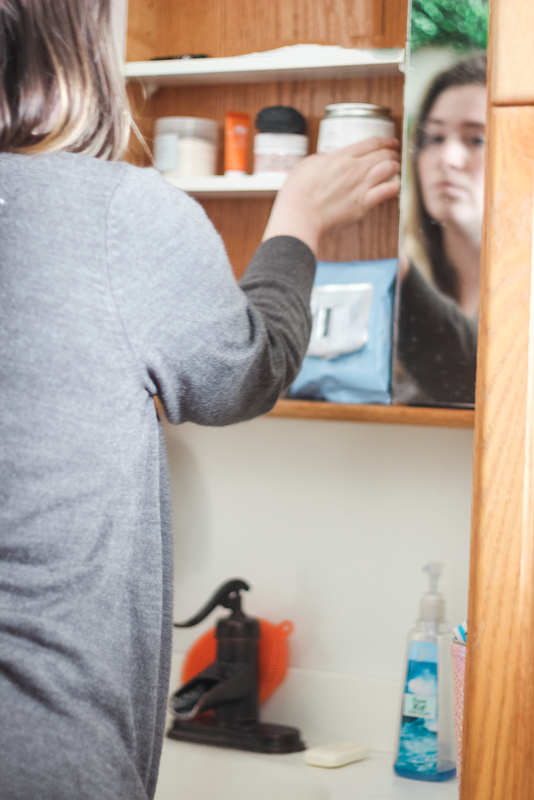 If I see any leftover makeup from the day before (hey, it happens), I'll go in with a Neutrogena Makeup Removing Cleansing Towelette and clean up. I feel like these wipes are a cult classic in the beauty world - and for a good reason! They always seem to be able to break down anything - even stubborn waterproof mascara! Next, I'll use the Nip+Fab Glycolic Fix Daily Cleansing Pad and gently rub the pad around my face, making sure to keep away from my eye area. These pads are awesome as they are pre-soaked in 2.8% glycolic acid (for exfoliating your skin), hyaluronic acid (to moisturize), witch hazel (to tone) and blue daisy (to soothe). I've noticed my skin looks significantly smoother using these and highly recommend them. Lastly, before makeup, I like to use a facial oil to moisturize and prime my face. I have found that using a facial oil underneath my makeup has given my face a healthy glow, moisturizes, makes my foundation application smoother and seems to keep my makeup on longer. I've been using the Paula's Choice RESIST Moisture Renewal Oil Booster but some other faves of mine are the Josie Maran Light Argan Oil. Sunday Riley Juno Facial Oil and, while I haven't tried this one yet, I've heard amazing things about the ELEMIS Pro Definition Facial Oil. My night time skincare routine is the most important to me. I never sleep in my makeup (although I totally get that it happens) and always try to remove it and moisturize my skin before it's bed time. Rodial Stem Cell Cleanser ($34) - If you are looking for the tallest drink of water for your skin, look no further because this cleanser leaves your skin feeling moisturized and soft. It's filled with anti-oxidants, coconut oil, rose hip oil, rose wax, cocoa butter and advanced technology from the PhytoCellTec Alp Rose (stem cells) to protect your skin against any further damage. It comes with a muslin cloth so you can you it to massage the product which was nice in the beginning but now I just use my hands and then wash it off. I like using this cleanser at night to let all the leftover oils melt into the skin overnight. *Also doubles as a makeup remover. Paula's Choice Softening Cream Cleanser ($18) - This cleanser plays along the same lines as the Rodial one as it's a lightweight cream cleanser that lives your skin soft - at almost half the price - but I think the Rodial one is a bit more moisturizing. Still, this cleanser is honestly my good ol' faithful cleanser and I've been using it for years. I think the price point is amazing for how soft it leaves your skin. Masqueology Jeju Volcanic Ash Charcoal Pore Cleansing Bar ($7) - This cleansing bar is probably my most newest addition to my skincare. I'm all about the charcoal lately! To use this, wet your hands and rub the bar to create a little lather. Massage on your face (or body!) and then rinse. I do find this to be slightly drying so I try to use it only a few times a week but I love the way it smells and seems to clear up my skin! After cleansing, I like to use a toner like the bliss Daily Detoxifying Facial Toner. It's alcohol-free, which I like and supposedly helps minimize pores. Honestly, I don't really notice if it minimizes anything but I like the way it makes my face feel - tight (but not uncomfortable) and hydrated. Another great option is the Paula's Choice Enriched Calming Toner which really soothes your face! Lastly, for added moisture on my face, I'll use the Paula's Choice RESIST Moisture Renewal Oil Booster and dot it on my face and gently rub it in. While we're on the subject of moisturizing...do you moisturize your body? I always use to leave it out in my routine but now it's a must-have. I've been using the Farmhouse Fresh Moon Dip Back To Youth Body Mousse ($32) for my neck, arms and legs and ya'll, it's heaven. Straight up heaven. Farmhouse Fresh is already on my top five favorite skincare brands list anyway, but goodness, this stuff is good. First off, the scent is so light and delicious. It's so good. It's made of a bunch of vitamin-rich emollient oils that just soak right into your skin, leaving it soft and firm. I'm obsessed with it!